Big Chief Custom. First Factory Custom Indian Chief Showcasing New Accessories. 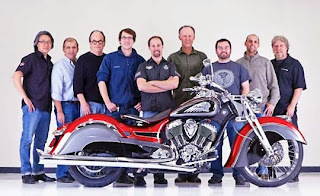 Indian Motorcycle Unveiled The Big Chief Custom. First Factory Custom Indian Chief Showcasing New Accessories. At the Motorcycle Display inside the International Motorcycle Show (IMS) at the Javits Center in New York City, Indian Motorcycle®, America’s first motorcycle company, revealed a fully customized, Indian Chief Classic conceptualized and designed by Indian Motorcycle’s Industrial Design team. The “Big Chief Custom” is the first custom Indian Chief created around the 2014 models introduced with great fanfare at the Sturgis Motorcycle Rally this past August. Spearheaded by the head of Polaris Industries’ Industrial Design team Greg Brew, a small and dedicated team undertook the task of customizing a stock 2014 Indian Chief Classic. It features an array of Genuine Indian Motorcycle aftermarket accessories along with a custom paint scheme and billet girder front fork. This Big Chief Custom was designed to spark owners imagination on how to customize, enhance and personalize the 2014 Indian Chiefs. 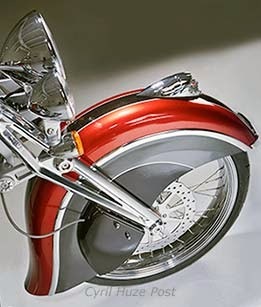 One special highlight of the custom build is the billet aluminum girder front end that recalls the early Indian models. Designed, machined and built in-house, the girder fork features fully machined uprights and sand-blasted billet cross members with a custom 23-inch front wheel. 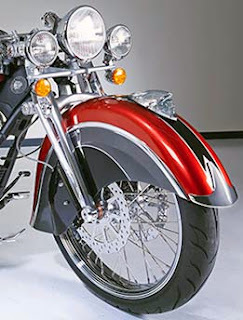 The custom front valance fender maintains the classic look of the Indian Chief. A custom shock and headlight complete the front end package. Custom paint was applied in-house by team member Steve Leszinski with a multicolored theme from prior generations of Indian Motorcycles. 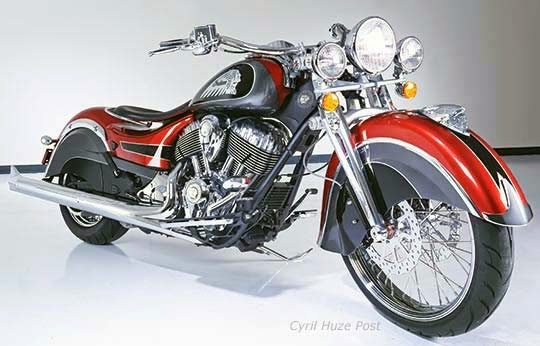 Another nod to the long history of Indian Motorcycle is the springer style seat, though updated through a cantilevered design. Combined with the standard single rear shock, the Big Chief Custom promises to be a smooth ride. MILWAUKEE (Dec. 17, 2013) – Members of the Harley Owners Group®, the official riding club of Harley-Davidson Motor Company, celebrated H.O.G.’s commitment to freedom and self-expression by choosing a new logo for the world’s largest rider club. The new visual element evolves the design of one of the most recognized symbols in motorcycling and creates more choices for members to express their pride in H.O.G.® membership. The new logo is the latest in a series of enhancements to the H.O.G.® membership experience in 2013, including a refreshed members-only web site, updates to the company’s Ride Planner online ride mapping service, and launching a digital edition of HOG® magazine for mobile devices. More than 100,000 H.O.G.® members around the world voted online and overwhelmingly selected the winning logo over several proposed designs. The new design captures the spirit of the original Heritage design, which has been in use since the beginning of H.O.G. in 1983, and remains instantly recognizable to legions of H.O.G.® members around the world. Major changes to the logo include bringing the Harley-Davidson Bar & Shield into the heart of the design, proudly representing H.O.G.® as the official riding club of Harley-Davidson, while the eagle shifts its gaze in a new direction to seek new horizons and adventures. Both the new and Heritage versions of the H.O.G. logo are available now on patches and other merchandise and will be joined by additional graphic options in the future to provide members with even more opportunities to express themselves and show their pride in membership. With nearly 1 million members and more than 1,400 chapters in 140 countries, the Harley Owners Group® is the world’s largest rider club, providing its members with rewarding benefits and unique experiences that enhance their motorcycling experience. For more information about the Harley Owners Group visit h-d.com/hog.